Is It of Works of Is It Grace? What and insult the fearful mind of man is to God. 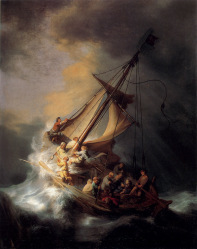 “Don’t you care that we perish?” The Son of God was in perfect peace and rest even as a great storm bashed away at the little boat they were in. He knew the end from the beginning. Didn’t He hear the Father say, “Go to the other side of the lake”? After all we know that He only spoke the words He heard His Father saying. I think that the second to the last paragraph in my last blog article “The Process of Faith…” has pulled a lot of us off coarse and I apologize for that. The heart of the questions that have come up regarding it seems to be this, “Is it of works or is it grace? Wait a minute! I thought we were saved by faith? But here Paul writes that we are saved by grace! You see, God is the Prime Mover in our salvation and desires to be such in our lives as well. It is because of His mercy and grace that any of us are saved, not because we have worked hard enough to earn it. He even gives us the faith we need to believe in His Son! So where do works come into the Heavenly picture? He has made us ALIVE with and IN Christ! The works are not our own, but of Christ in whom we dwell. As Paul said in Acts, “In HIM we live and move and have our being… for we are also His offspring.” We who are born from above live in Christ, move only in Christ for IN Him we have our very beings. If we are still living in and of ourselves all that we do, no matter how “good” the works we do might be, they will never satisfy the Father for only those works which are inspired by and come out from the Father and the Son have any eternal weight of glory in them. Yes, we have been saved by grace and the faith of Jesus which the Father has put in our hearts, but as we see in this passage, we are then MADE TO SIT in heavenly places IN Christ… that same Christ who was dying on the cross and cried out “It is FINISHED!” If we are not resting in the Father’s grace and Jesus’ completed work on the cross, we can NOT walk by faith. Jesus said, “My Father works still and I work.” This is the only work that counts in the Father’s kingdom and for His kingdom purposes. To the natural man, the Adam nature within, grace is an insult. The old nature of Adam has been snake bit for that serpent of old said to Eve, “For God knows that the day you eat of this tree, you will be like God knowing both good and evil.” Oh, how the fallen adamic nature within wants to be “like God.” How we love our “good works.” It is all about the source of the works we do that makes the difference. Jesus said, “Every plant, which my heavenly Father has not planted, shall be rooted up.” He did not say that it would never take root, but that it would be rooted up. So, our efforts to be “like God” in our state of rebellion (not abiding in Christ and His rest) leads us into doing all kinds of “good works.” But guess what, just as we have to be born from above by the Father, so all works that are done and are to remain, these also must be born from above as well. In HIS rest we cease from our own labors and truly begin to walk by faith. Now that we are saved, do we become totally inactive? No, we become obedient to HIS workings as we are activated by the Holy Spirit, following His leading and being empowered by His grace to do those works that He has foreordained from the foundation of the world that we should walk in them. All of our imaginings are to no avail when it comes to doing the works of God. Peter wrote, “But with the precious blood of Christ, as of a lamb without blemish and without spot: Who verily was foreordained before the foundation of the world, but was manifest in these last times for you” (1Pe 1:19-20 KJ2000). Do you see what I mean by timelessness in God? Christ was crucified in the mind and plan of God from the foundation of the world, but it was not made evident to man until 2000 years ago, thousands of year after the initial six day of creation. So it is with all His works that He seeks to manifest in and through us! To be in His rest is to be in-tune with His will. Here in these two verses we see “not of works,” “His workmanship” and “created in Christ Jesus unto good works.” Which way is it, Paul? Is it not of works or is it unto good works? A Pharisee came to Jesus and said ,”Good master…” Jesus answered back, “Who do you call good?” Only one is good and He is our Father in heaven.” Our Christian lives are not about us or our goodness! Any doing that happens in us is not of our works! In us dwells no good thing, unless that indwelling is the life of the Father which was put in us at salvation. “Every good gift and every perfect gift is from above, and comes down from the Father of lights…” (Jam 1:17 KJ2000). So we must understand that the Father has created us IN His Son, Christ Jesus, and it is from abiding in Him, the True Vine as HIS workmanship that we bring forth good fruit (See John ch. 15). Do we imagine a “good thing” to do or set out to do something because we read about it in the Bible? NO! We abide in the Son IN whom we have been created and then the Father’s works which were ordained form the foundation of the world are ours to walk in. Without entering into HIS rest, we will never know those works, much less walk in obedience to the Father as Jesus did. Our frenzied minds which seek to cover our spiritual nakedness with religious garments of fig leaves must be crucified. We MUST have the mind of Christ or we will never know the Father’s works much less do them. So, is it of grace or of works? Both… His grace and HIS works. We can not generate His grace and we can not generate HIS works. Father is our All in all.